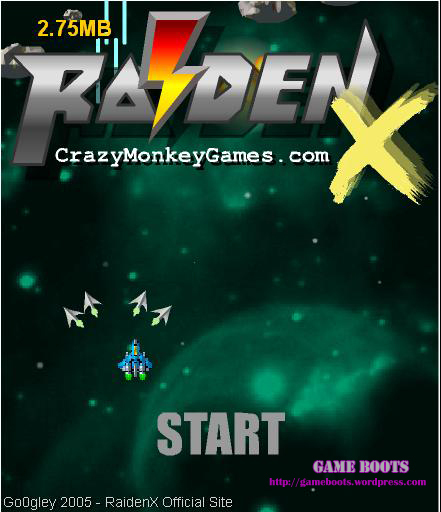 Raiden X is a game made by Go0gley for CrazyMonkeyGames.com. It’s gameplay is exactly like the game it’s named after, which is Raiden. 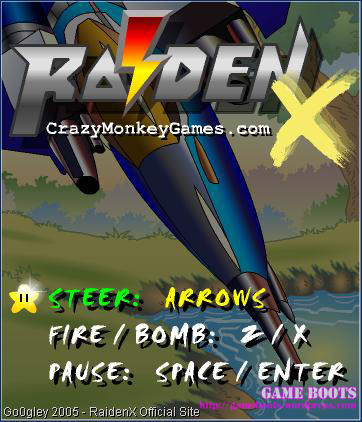 I missed Raiden so much that I’m so thrilled to find a vertical shooter game which has wonderfully similar graphics and features! It only has 8 levels which is a little disappointing because you just want to keep on playing and playing but the SAVE feature is so awesome!!! You can save your game at the end of each level and load it so that you start where you ended. It’s good for those who want to finish with a perfect game and just start all over again in a level if you get hit once. Aside from the SAVE and LOAD functions, it features difficulty levels, graphic options (the game itself is not that big so I don’t think choosing a low quality graphic would make a difference), of course sound option and a RESTART option. Please take note, RESTART lets you restart to the 1st level (back to zero) and not the start of the level you are on. 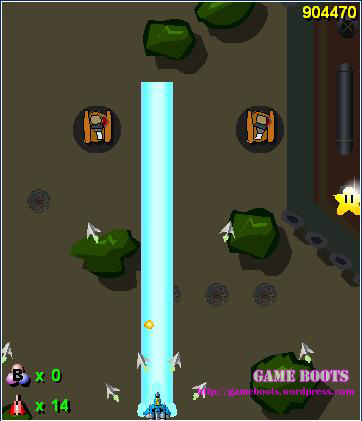 Laser – the blue gem item and shoots blue laser at enemies. This is the strongest (kills instantly) but has a downside to it. It only shoots in front of the ship. 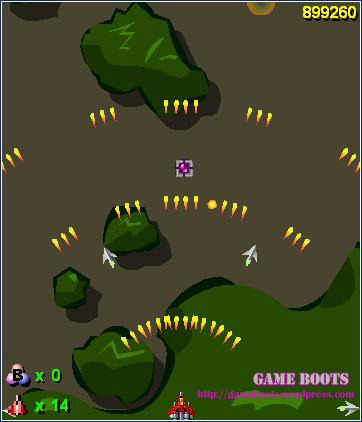 But if you’re going through the level and want to be lazy and not need to aim at the enemies, you can pair this up with Homing Missiles. Pairing it with Missile for the boss fights will make it like a walk in the park. 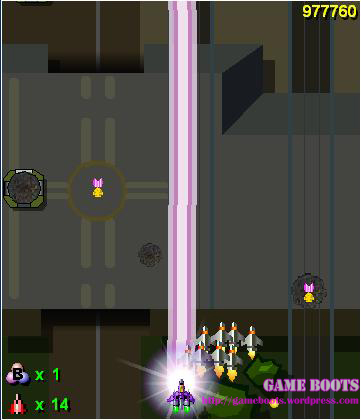 Vulcan – the red gem item and shoots red vulcan ammo at the enemies. Has mid level power and at max level it spreads and covers almost the whole screen. Not really a favorite of mine because it just messes up the whole screen which confuses me with everything going on and trying to avoid enemy “bullets”. You can pair this up with the Missiles which fire just in front of the ship so that you’ll have power to finish off whatever’s in front of you. Plasma – the violet gem item and shoots homing plasma which tracks and locks on to 1 enemy at a time until it finishes it off. If paired with Homing Missiles, it will be redundant but fun to look at and use. It’s the weakest so it’s not really recommended to go into boss fights with it. Best paired with Missiles though if you like to go through boss fights with a little bit of challenge than using Laser. Plasma with Homing for double homing fun! Plasma with Missiles to balance power with... umm... laziness? On the title screen, select “New Game” whenever the background animation is flashing white. If you get the timing right, you’ll start with 5 bombs instead of 3! For a better success rate, play at normal resolution (300×350) to reduce lagging. In stage 3, just before you reach the open harbour, you’ll see a blue box marked with a “?“. Don’t shoot at it (if you have homing missiles or a wide-spread gun, let go of the FIRE key). Try not to die either, or the debris of your ship may hit the box. During the takeoff sequence after stage 5, press CTRL. A textbox at the bottom-right corner will pop out. Type in “go0gleypower” and after the animation (stage 6), you’ll remain invisible for 20-30 seconds. Survival guaranteed! You’ll return to normal at around the time you see the ruby (which gives you a 1UP). Overall, there’s nothing I don’t like about this game except for the fact that it only has 8 levels. Not enough for me! But I heard that there’s going to be another version coming out soon so I’m looking forward to that. 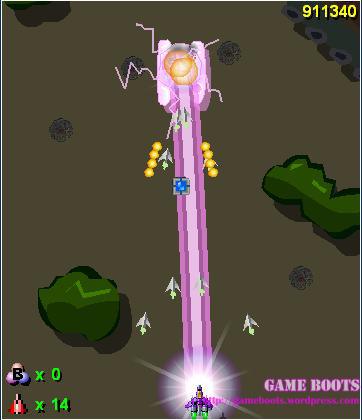 This entry was posted in Reviews, Shooting Game, Tips and tagged arcade, cheats, classic, free games, online, play, Raiden, Raiden X, review, shooter, strategy, tip, tips. Bookmark the permalink.